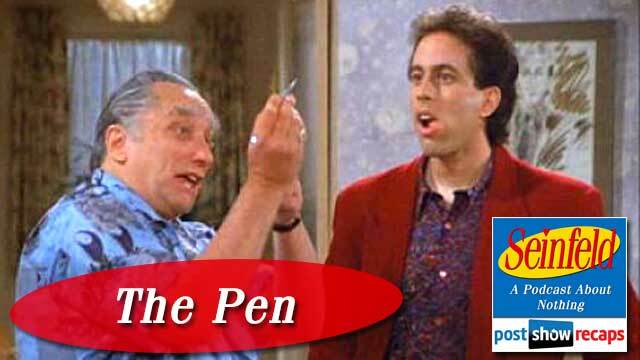 Rob and Akiva took the astronaut pen from Jack Klompus to jot down their notes for recapping “The Pen”, which is the 3rd episode of Seinfeld’s season three. The episode first aired October 2, 1991, and is remembered as one of the greats. 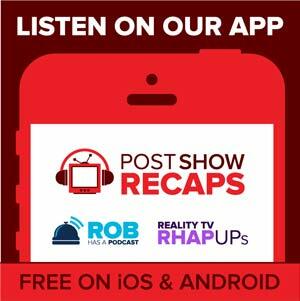 Rob felt partial to “The Pony Remark” as his favorite so far, but Akiva puts it atop the list of episodes covered on the recap. A few unusual notes about the episode that Rob shared were that it was filmed entirely at the Seinfeld’s retirement community (which was not referred to as Del Boca Vista yet), and that George and Kramer did not appear in it at all. Also, Jason Alexander was none too happy about not appearing in it, having a confrontation with Larry David about it where he said if he was left out of another episode, then he’d want to be out of the show completely. Jerry’s opening standup was a bit about how parents always refer to swimsuits as “trunks”. The episode opens with Jerry’s parents waiting for Jerry and Elaine to arrive, wondering if they should call the airline to check on them. Morty is upset about the missing scotch tape, and threatens to hide it so it won’t get taken again. Rob shared a story about how he used to hide his wallet when he’d come home from the bars, then wouldn’t be able to find it the next day. When Jerry and Elaine finally show up at the Seinfeld’s, they explain that they rented a car, which Jerry’s parents think was a waste. Jerry and Elaine immediately notice that it is extremely hot in their condo. The purpose of Jerry and Elaine’s visit is to commemorate Morty’s end as the condo president, which Rob felt was a strange thing to celebrate, noting that even Uncle Leo came down to take part. Akiva said that it’s possible that they wrote it as Uncle Leo lived down there. Jerry and Elaine have only two options for sleeping arrangements, either a small love seat in the living room, or a pull out couch in the spare bedroom. When Elaine is in the other room, Jerry’s mom asks about his relationship with Elaine, which Jerry shares that they are now just friends. Akiva said this scene might have been a way to show that their arrangement from “The Deal” is officially done. Jack Klompus and his wife come in and immediately started in with Morty about splitting the cost of their dinner the night before. Rob and Akiva noted that Jack Klompus is one of the great sub characters, unlike many of the others that have appeared so far. When Jack is writing out the check, Jerry comments on the pen Jack has, and how he really wants one like it for when he’s writing jokes in bed. Jack tells him to take the pen. Even though Jerry says no thank you at first, Jack talks him into taking it, much to Helen’s chagrin. She tells Jerry when Jack leaves that it was a bad idea to take the pen, since he loves and talks about it so much. Akiva and Rob play a guessing game on how much an astronaut pen must cost. Akiva guessed $50, while Rob guessed $12.99. The cost on Amazon ended up being between $15 and $35. Elaine, who came on the trip to go scuba diving, ends up sleeping on the pull out couch, while Jerry is out on the small love seat in the living room. When Jerry checks on her, she is tossing and turning because of the heat and a giant bar that runs across the middle of the bed. The next day, Elaine wakes up and can barely walk, keeping her from going scuba diving. Rob talked about how he went scuba diving with Rudy, Tina and Richard Hatch, and doesn’t see the big deal in it. Elaine is lying on the floor begging for Morty to turn on the air conditioner, which he has no idea how to work. One of the Seinfeld’s neighbors, Evelyn, comes in and right away brings up to Jerry about the pen, proving Helen right that word would spread about Jerry taking Jack’s pen. Someone else calls Helen to ask about the pen, while Elaine keeps yelling for Morty to get the air conditioning going. The scene cuts to Jerry coming back from scuba diving with black eyes, caused by the pressure from the scuba mask. Jack Klompus comes back over, and Jerry gives him the pen back, saying he doesn’t need it. Morty gets mad at this, yelling at Jack that he should let Jerry keep the pen. Jack points out that you don’t take everything you are offered, just like he didn’t take the sponge cake even though he loves it. In the next scene, Morty, Helen, Elaine and Jerry are having their pictures taken at the ceremony, but Elaine is completely loopy from the muscle relaxers Morty gave her. Uncle Leo walks in with his wife (that will never appear or be spoken of again), and comments to Jerry how his material he saw on The Tonight Show is stale. He offers to have cousin Jeffrey help him write jokes. Elaine, laughing hysterically at how Leo’s wife is named Stella, starts yelling her name ala A Streetcar Named Desire, leaving no doubt to the other party goers that she is hopped up. Helen remarks after they walk off that she hates Stella like poison. The ceremony begins with Jack Klompus emceeing, and he uses the opportunity to roast Morty, rather than honor him the way it was intended. With each barb that Jack throws, Morty responds with some poor retorts, until he yells out how Jack took back the astronaut pen, which causes a scuffle. While the old men are fighting, Helen tells Jerry to start telling jokes, or everyone will leave. Rob and Akiva pointed out that amongst the ruckus, Larry David’s voice is heard yelling things a few times. Back at the Seinfeld’s condo, there is a chiropractor checking out Elaine’s back, and he tells them that she will have to stay right there for five more days. Jerry sheepishly tries to see if he can leave her there, but Elaine squashes it right away. Jerry tries to make the five days sound like a lot less by describing how it will feel like a day, tying back to the beginning of the episode when he tries to convince her their initial stay will only feel like 20 minutes. The episode ends with a Jerry standup that Akiva found pretty weak. After recapping, the guys read some listener emails. Johnny asked if the guys have had to sleep on a sofa bed where the bar was right in their back. Both agree they have, and Rob commented how he has even slept on an inflatable mattress for a week. Chester asked why didn’t Jerry and Elaine stay in a hotel, since they rented a car anyway. He also asked why doesn’t anyone recognize Jerry on the street when he’s been on the Tonight Show. Akiva agreed that they should have stayed in the hotel, and that it’s odd that Jerry isn’t recognized more. Chester also points out that an old man fist fight would be a must watch, so why would Helen feel like Jerry should do something to keep the guests there. Both Rob and Akiva felt that was a fair point. Lastly, Chester wants to know what doctor would make a house call in 1991. The guys didn’t think it was hugely out of the ordinary as a chiropractor to do that. Join the guys next week as they recap “The Dog”, which Akiva feels will be the worst episode covered up to date. You can send your emails to Rob and Akiva at [email protected]. Don’t forget to follow them on twitter @robcesternino and @keev26. And if you haven’t already, subscribe to Post Show Recaps on iTunes by going topostshowrecaps.com/SeinfeldITunes.